We will discuss about the revolving motion of the earth. Apart from the earth’s rotator motion, the earth also revolves around the sun. The movement of the earth around the sun is called revolution of the earth. The earth takes about 365 days or one year for one complete revolution around the sun. The axis of the earth is slanted at an angle of about 23’5° for revolving motion around the sun, the earth remains slanted and for that its one hemisphere remains near the sun and the other hemisphere is away. Tilt in the axis of the earth and its revolution around the sun causes changes in the season. As the earth revolves around the sun with its inclined axis, when the northern hemisphere comes near to the sun the southern hemisphere is away from the sun. Nearness to the sun causes summer season in that hemisphere. When the sun is away from the hemisphere, there is winter. When the northern hemisphere is nearest to the sun the earth is revolving around summer and the southern hemisphere will be away from the sun. So there would be summer in the northern hemisphere and winter in the southern. When the earth moves towards west on its revolution-path, the northern hemisphere begins to be away and the southern hemisphere closer to the sun. In autumn, both the hemispheres lie at equidistance from the sun. Now it will be neither to hot nor too cold in both the regions in the northern hemisphere. The earth continues to revolve on its path and comes in the winter season. 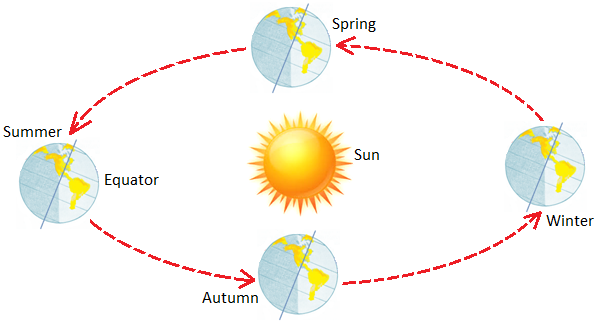 In winter the north hemisphere goes away from the sun and the south comes closer to the sun. That brings winter to the northern region and summer to the southern. The earth continues its movement around the sun and begins to go from east to west on its revolutionary orbit. The northern hemisphere begins to get nearer and southern hemisphere farther from the sun. Gradually both the hemisphere get to equidistance from the sun in spring season, which makes the regions equally hot and cold. In both the hemispheres it would be neither too hot nor too cold. Finally through the earth’s continuous movement, the earth goes to summer season when the northern hemisphere was near and the southern hemisphere away from the sun. The earth thus completes its one revolution. During one complete revolution, the earth undergoes numerous changes in the seasons. In northern hemisphere the seasons are known as summer, autumn, winter and spring. In between the summer and autumn there are heavy rains in the northern region of the earth so, they are known as monsoon or rainy season. In summer season the days are longer than the days in winter. The change of seasons and duration of day and night depends upon distance of the sun from the earth. Thus, the sun is the main reason of changes in the seasons.